Buffalograss has become more popular in recent years due to its reputation as a low-maintenance grass. 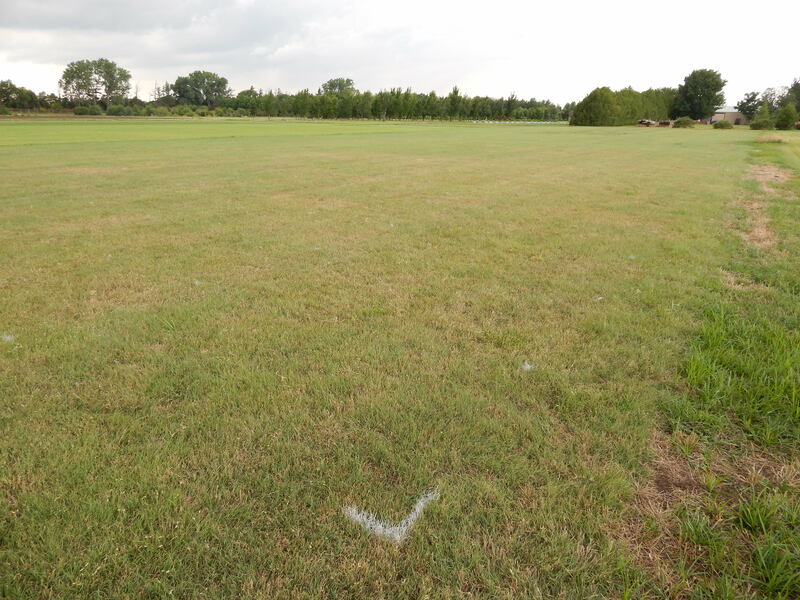 Buffalograss does require less water and fertilizer than our other turfgrasses but often has problems competing with weeds in eastern Kansas. Remember, buffalograss is a low-maintenance lawn and not a “No”-maintenance lawn. 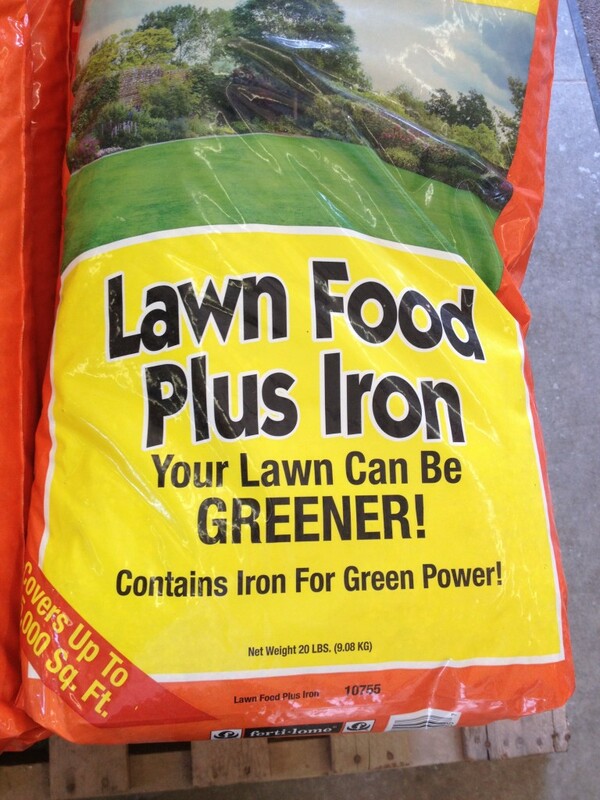 Fertilize with 1 lb. of nitrogen per 1,000 square feet during June. More applications will give a deeper green color, but can encourage weeds. If it is felt that a second application is needed, apply in July. If grubs have been a problem in the past, apply a product containing imidacloprid by mid July. Imidacloprid can be applied as early as mid May if there are problems with billbugs or May beetle grubs. These products kill the grubs before they cause damage. They are effective and safe but must be watered in before they become active. Again, I would only treat if grubs have been a problem in the past. Note that the whole area may not need to be treated. The beetles that lay the eggs for the grubs are attracted to lights and moist soil and those areas are most likely to be infested. Spray for broadleaf weeds if they are a problem. Look carefully as our winter annuals such as chickweed and henbit are small and easily overlooked. Use a product that contains 2,4-D as it increases effectiveness on dandelions. Treat on a day that is at least 50 degrees F. Rain or irrigation within 24 hours reduces effectiveness. Use the rates listed on the label for all products mentioned. Always remember to READ THE LABEL for the correct rate, turfgrass tolerance, and specific instructions before application!!! Just recently I was invited to speak with Eric Atkinson, host of Agriculture Today a daily program distributed to radio stations throughout the state. It features K-State agricultural specialists and other experts examining agricultural issues facing Kansas and the nation. I spoke with Eric about some issues that Kansas homeowners might be facing with their lawns and a couple things that homeowners shouldn’t worry about this year. 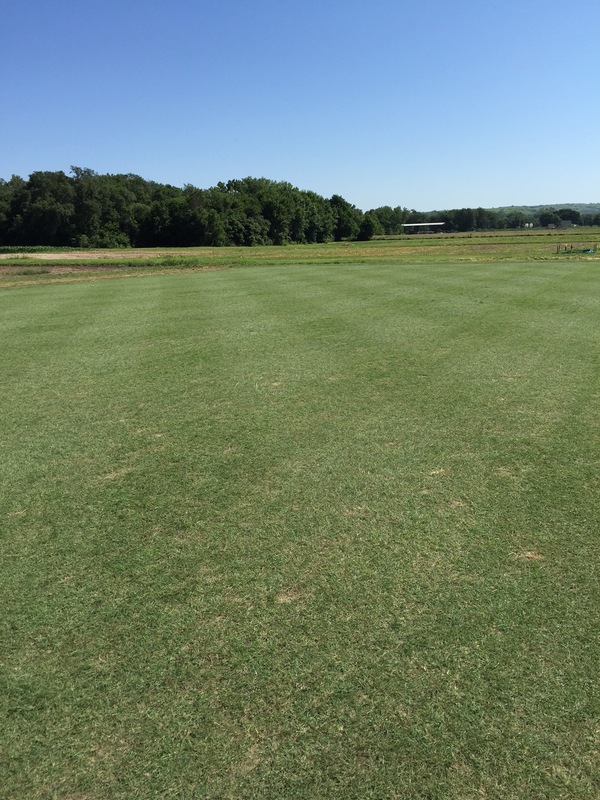 Bermudagrass requires the most nitrogen. High-quality bermuda stands need about 4 lbs. nitrogen per 1,000 sq. ft. during the season (low maintenance areas can get by on 2 lbs.). Apply this as four separate applications, about 4 weeks apart, of 1 lb. N per 1,000 sq. ft. starting in early May. It is already too late for the May application, but the June application is just around the corner. The nitrogen can come from either a quick- or slow-release source. So any lawn fertilizer will work. Plan the last application for no later than August 15. 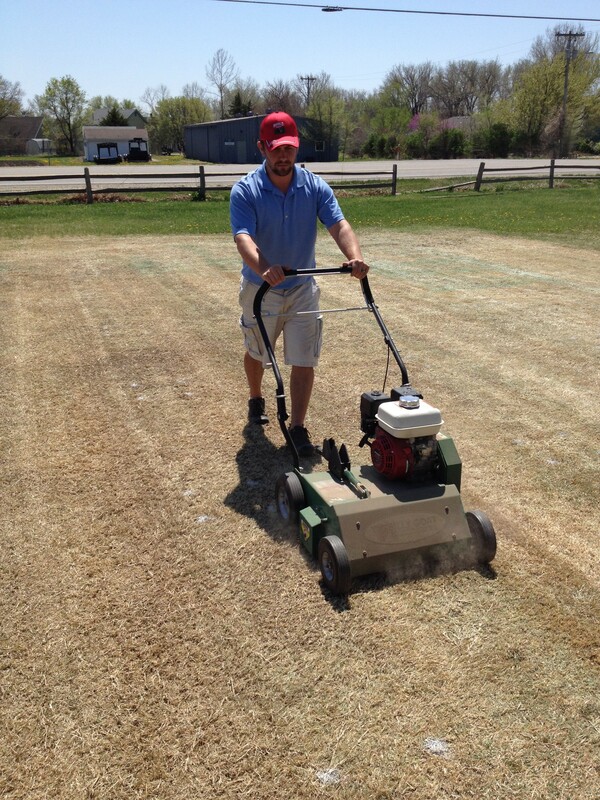 This helps ensure the bermudagrass is not overstimulated, making it susceptible to winter-kill. 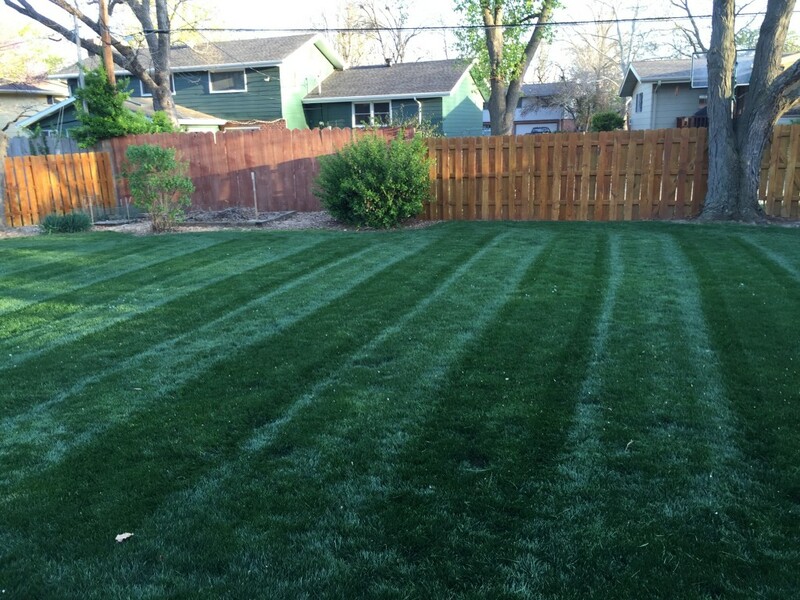 Buffalograss requires the least nitrogen of all lawn species commonly grown in Kansas. It will survive and persist with no supplemental nitrogen, but giving it 1 lb. N per 1,000 sq. ft. will improve color and density. This application should be made in early June. For a little darker color, fertilize it as described for zoysiagrass in the previous paragraph, but do not apply more than a total of 2 lb. N per 1,000 sq. ft. in one season. Buffalograss tends to get weedy when given too much nitrogen. As with zoysia, slow-release nitrogen is preferable, but fast-release is also OK. As for all turfgrasses, phosphorus and potassium are best applied according to soil test results because many soils already have adequate amounts of these nutrients for turfgrass growth. If you need to apply phosphorus or potassium, it is best to core aerate beforehand to ensure the nutrients reach the roots. 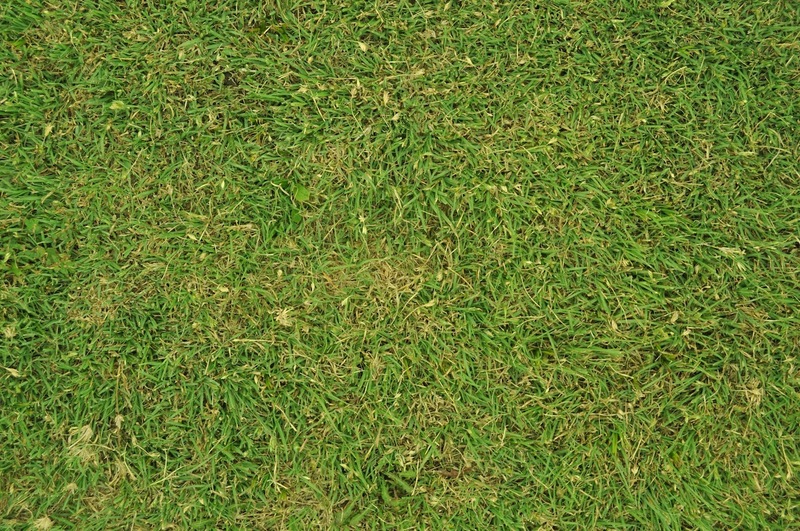 Thatch control for cool-season lawn grasses such as bluegrass and tall fescue is usually done in the fall but now is the time we should perform this operation for warm-season turfgrasses such as bermudagrass and zoysiagrass. Because these operations thin the lawn, they should be performed when the lawn is in the best position to recover. For warm-season grasses that time is June through July. Buffalograss, our other common warm-season grass, normally does not need to be dethatched. When thatch is less than one-half inch thick, there is little cause for concern; on the contrary, it may provide some protection to the crown (growing point) of the turfgrass. However, when thatch exceeds one-half inch in thickness, the lawn may start to deteriorate. Thatch is best kept in check by power-raking and/or core-aerating. If thatch is more than 3/4 inch thick, the lawn should be power-raked. Set the blades just deep enough to pull out the thatch. The lawn can be severely damaged by power-raking too deeply. 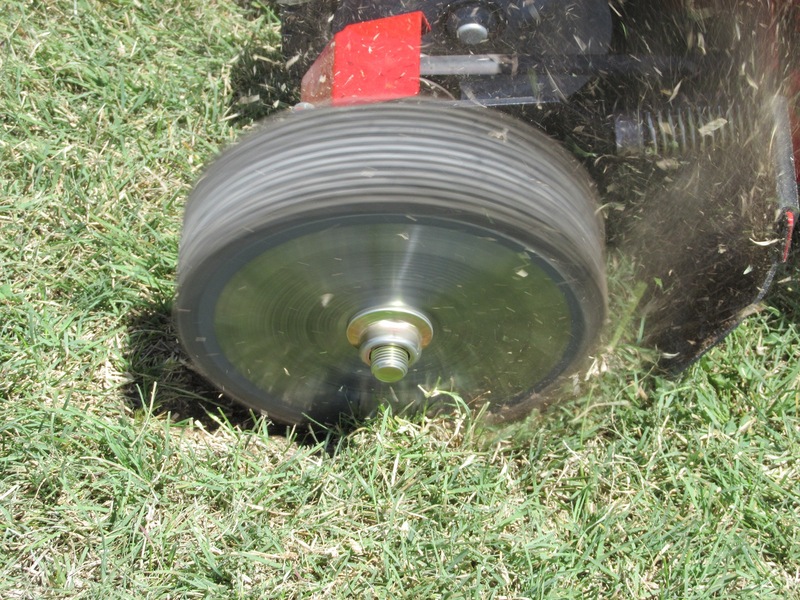 In some cases, it may be easier to use a sod cutter to remove the existing sod and start over with seed, sprigs or plugs. 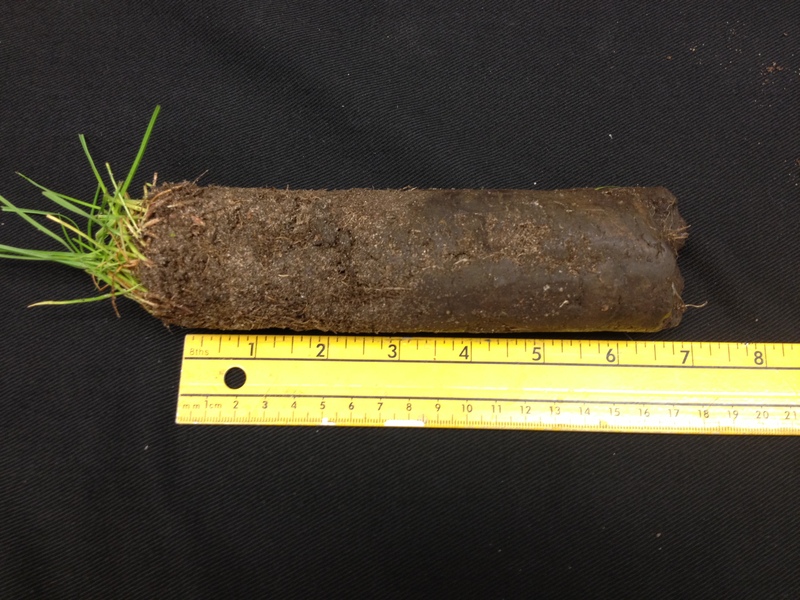 If thatch is between one-half and a 3/4- inch, thick, core-aeration is a better choice. The soil-moisture level is important to do a good job of core-aerating. It should be neither too wet nor too dry, and the soil should crumble fairly easily when worked between your fingers. Go over the lawn enough times so that the aeration holes are about 2 inches apart. Excessive thatch accumulation can be prevented by not overfertilizing with nitrogen. Frequent, light watering also encourages thatch. Water only when needed, and attempt to wet the entire root zone of the turf with each irrigation. Finally, where thatch is excessive, control should be viewed as a long-term, integrated process (i.e., to include proper mowing, watering, and fertilizing) rather than a one-shot cure. One power-raking or core-aeration will seldom solve the problem. In recent years, water conservation has been a growing trend in the golf course industry.With the spotlight on the golf course industry to become more conscious of the environment, one of the classic prairie grasses may be able to help low-budget golf course operations save water and money. buffalograss, Buchloe dactyloides, is known for being drought tolerant, which is why it fits into the discussion as a viable option for water conservation. 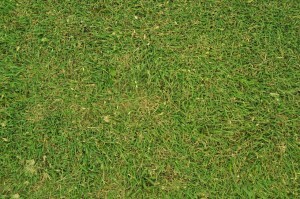 Additionally, buffalograss is also known for its disease resistance, as well as its slow growing characteristics. Buffalograss is very versatile and can be utilized on the golf course in native areas, roughs, and fairways. Many courses in Kansas are currently using this species in one of these three ways, however limited research exists to explore buffalograss management. In order to explore buffalograss in further detail, we decided to look at how fertility influences recovery from divot injury. Furthermore, we looked at the influence of quick and slow release nitrogen fertilizers and their rate on the divot recovery. 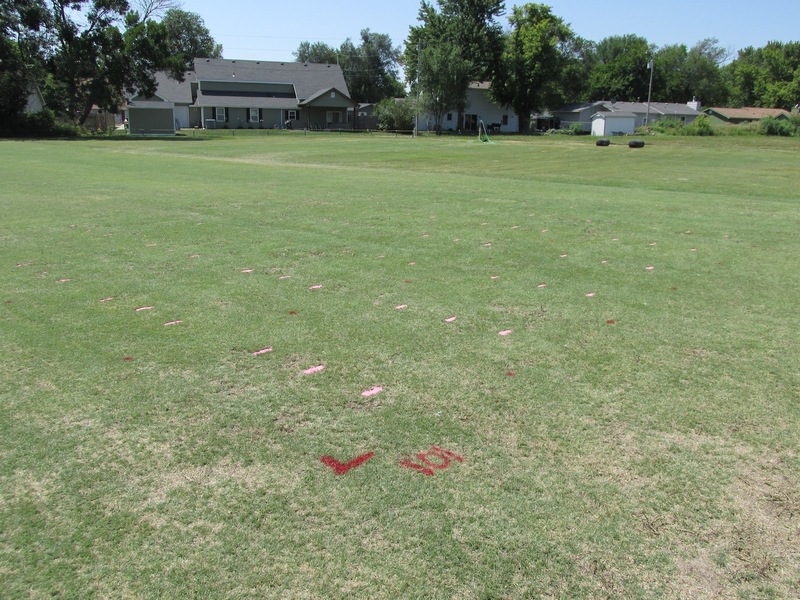 Turfgrass Research Station in Manhattan, KS, and one at the Council Grove Country Club, in Council Grove, KS. Divots were made using a modified edger with 13 circular blades. 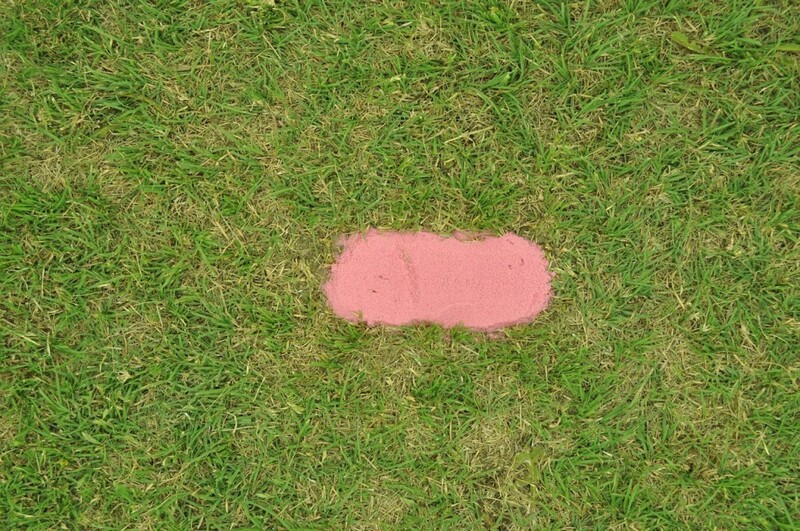 This device was able to produce a divot similar to a real divot one would find on the course. Each study consists of eight treatments arranged in a two by four factorial. 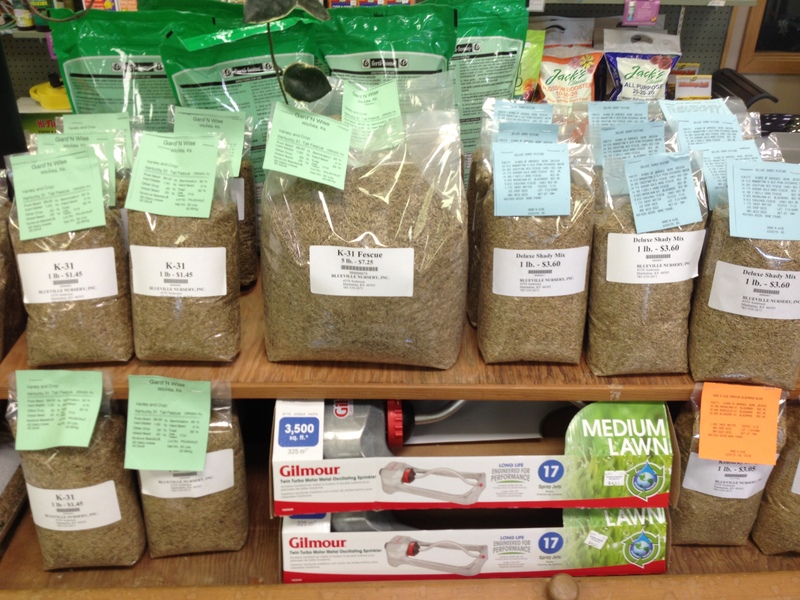 Factors included nitrogen rate and nitrogen source. Nitrogen rates were 0, 1, 2, and 3 lbs N /1000ft2. Nitrogen sources were Urea and Polymer Coated Urea (Table 1). Table.1 Influence of Nitrogen Rates and Sources on Buffalograss Divot Recovery Study Treatment List. *The quick release fertilizer that was used was a 46-0-0 Urea, and to achieve the 1lbs, 2lbs, 3lbs two half-rate applications were made, one on the initiation date, and the second four weeks after initiation. **The slow release fertilizer used was a 120 day controlled release polymer coated Urea, with an analysis of 43-0-0. Just one application of the slow release was made. Divot filled with pink sand to easier analyze divert recovery with digital image analysis. Pictures of each divot are analyzed with digital image analysis software to measure how quickly the divot recovers. Other data taken include visual color, quality, and percent recovery. Since the initiation of the study, we were able to see a definite flush of green from the application of the quick release fertilizer at all rates. In terms of quality, the plots that received 2lbs and 3lbs resulted in the highest quality. Plots receiving 1lbs of N/1000ft2 also resulted in acceptable turfgrass color and quality although lower than the 2lbs and 3lbs N/1000ft2 treatments. 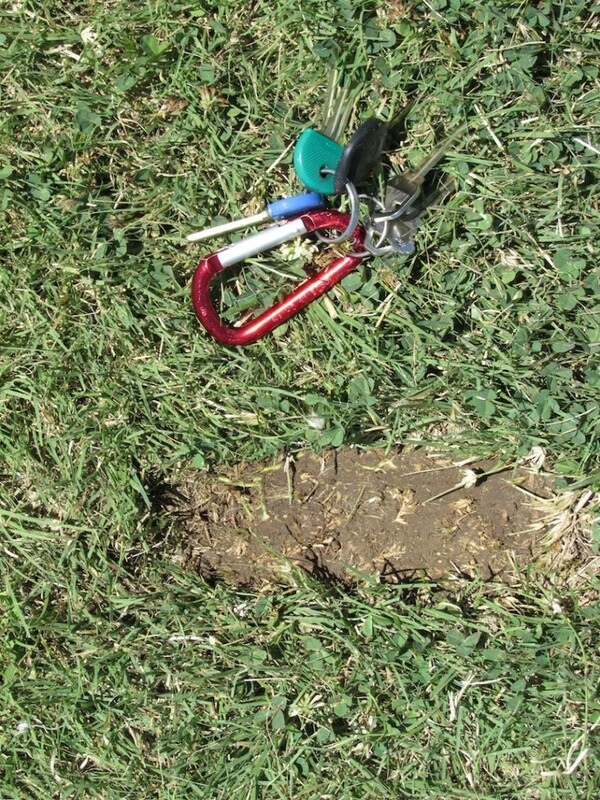 As far as the nitrogen rates influencing divot recovery, we hope to find at which nitrogen application rate and source will result in the quickest buffalograss divot recovery.